Summary and Definition: The Impeachment of Bill Clinton, due to events surrounding the Monica Lewinsky scandal, commenced on December 19, 1998 when he was impeached on two charges: perjury and obstruction of justice. The Senate trial resulted in votes of 45 to 55 on the perjury charge and 50 to 50 for the obstruction of justice charge. In both cases, a two-thirds majority of 67 senators would have been required for conviction and the president was therefore acquitted (found not guilty). Despite the scandal, President Bill Clinton retained his popularity as he completed the remainder of his term in office. Bill Clinton was the 42nd American President who served in office from January 20, 1993 to January 20, 2001. One of the important events during his presidency was his Impeachment trial by the Senate. Fast, fun facts and Frequently Asked Questions (FAQ's) about the Bill Clinton Impeachment. Why was Bill Clinton Impeached? President Bill Clinton was impeached due to a series of events that led him to make false statements about his sexual relationship with Monica Lewinsky, lying to the public, obstructing justice and invoking Executive Privilege. What was the result of the Bill Clinton Impeachment? President Bill Clinton was acquitted of these charges by the Senate on February 12, 1999. The Senate voted 45 to 55 on the perjury charge and 50 to 50 for the obstruction of justice charge. In both cases, a two-thirds majority of 67 senators would have been required for conviction. President Bill Clinton finished out the remainder of his term in office. The following fact sheet contains interesting facts and information on Bill Clinton Impeachment. Bill Clinton Impeachment Facts - 1: What is the meaning of Impeachment? The term 'Impeach' means to charge with a crime, misdemeanor, misconduct or misbehavior in office by a public official, including the US President. Bill Clinton Impeachment Facts - 2: What is the meaning of Impeachment? The process of impeachment involves a criminal proceeding against a public official, including the president. It is the right of the House of Representatives to impeach, and the right of the Senate to try and determine impeachments. Bill Clinton Impeachment Facts - 3: President Bill Clinton was the 42nd president of the United States, whose term in office spanned from January 20, 1993 to January 20, 2001. Bill Clinton was impeached by the House on December 19, 1998. Bill Clinton Impeachment Facts - 4: The Bill Clinton impeachment trial began in the Senate on January 7, 1999. 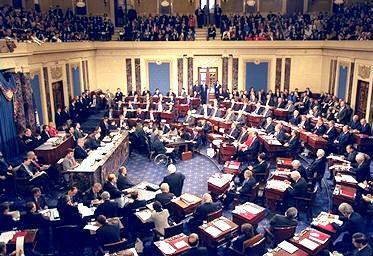 The impeachment trial ended on February 12, 1999. Bill Clinton Impeachment Facts - 5: The Senate was unable to reach the two third majority needed to convict, President Clinton was acquitted (declared not guilty) and finished out the remainder of his term in office to January 20, 2001. Bill Clinton Impeachment Facts - 6: President Bill Clinton was impeached was due to a series of events that led him to make false statements about his sexual relationship with Monica Lewinsky and lying to the public, obstructing justice and invoking Executive Privilege. Bill Clinton Impeachment Facts - 7: The reputation of President Bill Clinton had also been brought into question by the Whitewater Scandal during his first term in office. The Senate Special Whitewater Committee report on June 18, 1996, had hinted at one possible improper action by President Bill Clinton, but spoke of the "American presidency misused its power, circumvented the limits on its authority and attempted to manipulate the truth". Bill Clinton Impeachment Facts - 8: The scandalous reputation of Bill Clinton began during his time as Governor of Arkansas when a sexual harassment lawsuit was brought on May 6, 1994 by Paula Jones, a former Arkansas state employee. On May 27, 1997 the Supreme Court ruled that Paula Jones could pursue her sexual harassment lawsuit against President Bill Clinton, even while he was in office. (Bill Clinton entered into an out-of-court settlement by agreeing to pay Jones $850,000). Bill Clinton Impeachment Facts - 9: The name of a young White House intern called Monica Lewinsky, came to attention in the Jones case due to a deposition given by Linda Tripp, who also worked in the White House. Bill Clinton Impeachment Facts - 10: Linda Tripp was a confidante of Monica Lewinsky, who had told Tripp about her relationship with the president. Linda Tripp made tapes of their conversations and convinced Monica Lewinsky to save the gifts that Clinton had given her during their relationship, and not to dry clean what would later become known as "the blue dress". Bill Clinton Impeachment Facts - 11: News of the Clinton–Lewinsky relationship became public in January 1998 and the Monica Lewinsky scandal erupted. The following fact sheet continues with facts about the Impeachment of the president. 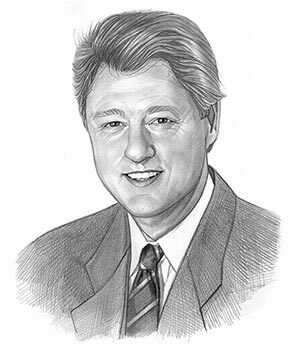 Bill Clinton Impeachment Facts - 12: On January 20, 1998 Bill Clinton strenuously denied the allegations regarding Monica Lewinsky scandal and stated on TV that "I did not have sexual relations with that woman, Miss Lewinsky". Bill Clinton Impeachment Facts - 13: Hillary Clinton publicly supported her husband, but apparently considered leaving her marriage during this highly publicized, humiliating and embarrassing period during their marriage. On April 02, 1998 a judge dismissed Paula Jones's sexual harassment lawsuit against President Clinton. Bill Clinton Impeachment Facts - 14: President Bill Clinton consistently denied all allegations of any instances of improper sexual conduct with young members of the White House staff, including Monica Lewinsky. Bill Clinton Impeachment Facts - 15: The infamous "Starr Report", by Independent Counsel Kenneth Starr, outlined the findings of the Independent Counsel's investigation which was delivered to the House of Representatives on September 9, 1998 and subsequently made public. Bill Clinton Impeachment Facts - 16: On December 12, 1998 the House Judiciary Committee approved 4 articles of impeachment, relating to perjury before the grand jury, perjury in a civil deposition, obstruction of justice and abuse of executive power. Bill Clinton Impeachment Facts - 17: On December 19, 1998 the House of Representatives approved two of the articles of impeachment relating to perjury and obstruction of justice. Bill Clinton Impeachment Facts - 18: On January 7, 1999 the Bill Clinton impeachment trial was formally opened in the Senate. Bill Clinton Impeachment Facts - 19: The perjury charge failed with 45 senators voting "guilty" and 55 senators (45 Democrats and 10 Republicans) voting "not guilty". Bill Clinton Impeachment Facts - 20: The obstruction of justice charge failed with 50 senators voting "guilty" and 50 senators (45 Democrats and 5 Republicans) voting "not guilty". Bill Clinton Impeachment Facts - 21: The Senate, unable to reach the two third majority to convict, acquitted the President and the impeachment trial ended on February 12, 1999. Bill Clinton Impeachment Facts - 22: The President carried on to finish the remainder of his term in office. Despite the scandals, Bill Clinton retained his popularity with the public. His presidency ended on January 20, 2001 when George W Bush assumed the role of President of the United States. Bill Clinton Impeachment Facts - 23: How many US Presidents have been impeached? Two presidents have been impeached: President Andrew Johnson and President Bill Clinton. President Richard Nixon was never impeached as he resigned before this type of action could be taken. For visitors interested in the history of impeached presidents refer to the Impeachment of Andrew Johnson. The article on the Bill Clinton Impeachment provides detailed facts and a summary of one of the important events during his presidential term in office. The following video will give you additional important facts and dates about the political events experienced by the 42nd American President whose presidency spanned from January 20, 1993 to January 20, 2001.